Math is one of those subjects that has moms thinking they could never homeschool, because they don’t feel confident teaching it. That’s why I’m happy there are companies like UnLock Math to help us mommas out!! Through my awesome relationship with the Schoolhouse Review Crew, UnLock Math gave me complimentary access to a full year of their UnLock Pre-Algebra curriculum! We are so blessed to be able to try out different programs so we can tell you about them. We had not decided on my 8th grader’s math curriculum for next year, so this was perfect timing. When your child uses this online math curriculum, she will be taught by Alesia. Alesia is a real live person and your child will get to see her on their screen during the lessons, instead of watching a video with a voice-over. Behind Alesia, is a 70” touch screen board. She uses it instead of a whiteboard and it’s great because the only things on your child’s computer screen are the board and the teacher… no distractions! With the use of the screen, there are things that are pre-typed/drawn out on the screen, plus Alesia is able to use it as a white board to work out the problems. It’s a great combination! When your child first logs in each day, the program will open up at the Dashboard. Once in the Dashboard, the student will click on the rocket next to the unit they are currently working on (under the word “Launch”). This will open up that unit and then the student will click on the next lesson or quiz they need to do. When they click on the next lesson, the program lays it out neatly for them… They can begin with a warm up, just to get their brain ready for math! Then, they move on the the short video lesson with Alesia. After that, they move on to the practice problems. When they do the practice problems, they will only see one problem on the page at a time. This is done on purpose, so the student doesn’t get distracted or overwhelmed. After the practice problems, the student will do the “Stay Sharp” problems. These are review problems so the student doesn’t forget what she has already learned. One less thing you have to worry about!! Grading! This program does all the work for you. The first 5 units of the program are review. That seems like a lot at first, but if your child has any gaps in that information, this will catch her up! My daughter has found some of the information to be easy, because it was review. Some of it, though, was a bit harder for her, so it is good that she had the review! Okay… Now you know how she feels. How does this momma feel?? Well, because she’s the one doing the program and learning the information, I have to side with her. I think we both like the lectures and the way the teacher explains things. We like the way the program is laid out. The only issue is when she doesn’t understand a concept, there is not an easy way to tell the program what she doesn’t understand. I know they are still working on improving things every day, so I’m excited to see if that changes. All that being said, we plan on continuing this program as her math for this school year! In the end, she still ends up understanding what is being taught… and that’s the whole point!! She enjoys the video lessons and the teacher does a great job of breaking down the information into small blocks making it easier to digest. What is it? 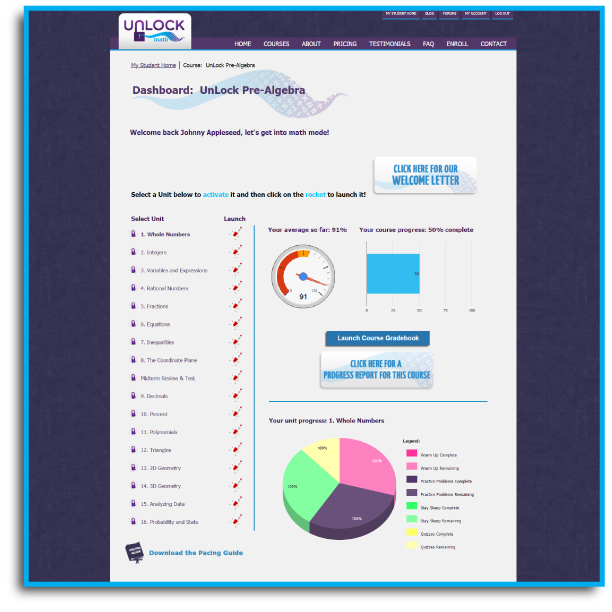 UnLock Pre-Algebra program, by UnLock Math. An online math curriculum. How much is it? There are a few options: $49/mo. for each student or $299/year, plus there is a 50% sibling discount. AND, if you refer a friend, they get $74.75 off the annual price and you get $20!!! Speaking of their refer a friend promotion… Go ahead and CLICK HERE and you can get your $100 off coupon!! The coupon code does expire in a couple of weeks, so be sure to use it soon.